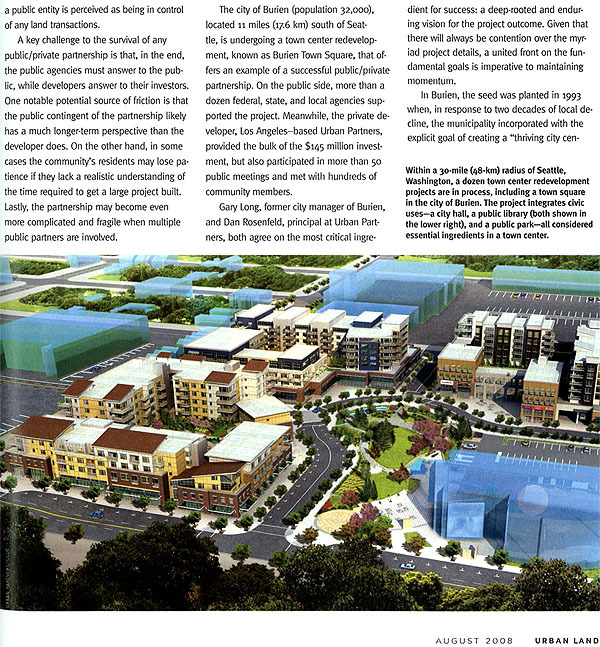 At the risk of giving the impression that I might possibly take any of this design and development wonkishness seriously, below is a piece I wrote for the August 2008 issue of Urban Land magazine. 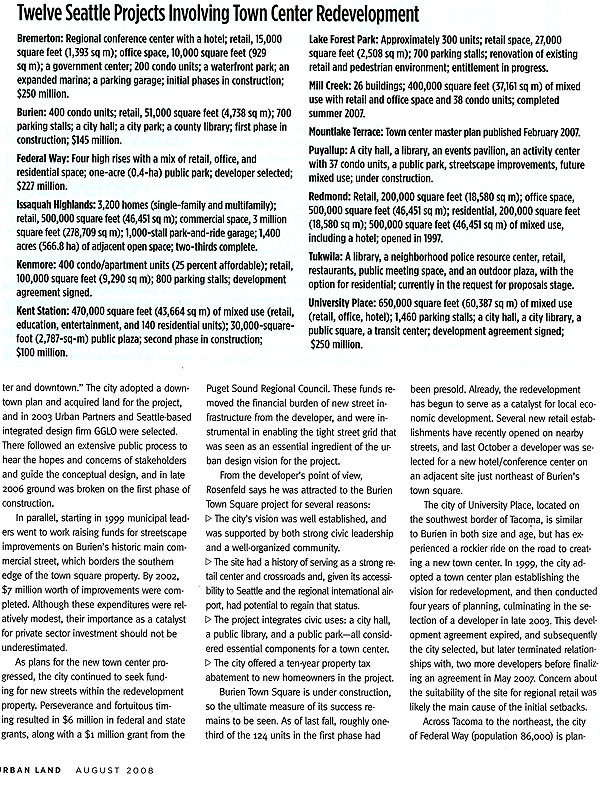 Apologies for the small print, but since the piece is only available online to paying ULI members, I only have permission to post a scan. Posted by dan bertolet on	Tuesday, September 23rd, 2008 at 9:27 pm. You can follow any responses to this entry through the RSS 2.0 feed. You can leave a response, or trackback from your own site. OMG Dan you’re with GGLO!? Ha! We are much closer to each other than I ever imagined. Good read you put together -my CEO forwarded it to us as mandatory reading. 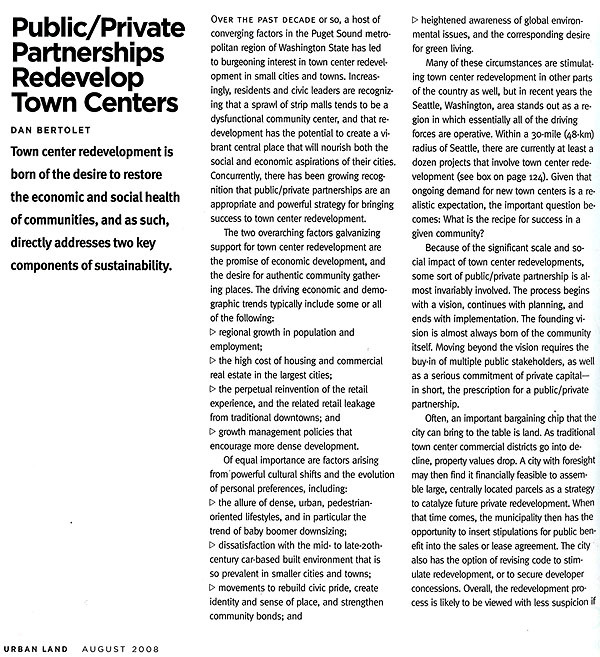 Enviro/Smart Land-use group, Futurewise (used to be 1000 Friends of Washington) is mentioning Burien Town Center in an upcoming newsletter. As a resident of that humble…er…city, I am pretty excited about the creation of something approximating a “downtown” here. It’s more than just sharp, new condos and better-than-merely tolerable restaurants (although those help). It’s the sense of community progress; that this is something that while making some developer and several builders some money, also enhances the quality of living in this place. Man I wish they’d start doing more of this stuff around here. Economy is worse than advertised, so we’ll have to wait even longer. Well done on the arty, Dan’l.